*Box scores are updated every two minutes. Please refresh page for latest scores. Victorious University of Madras team. 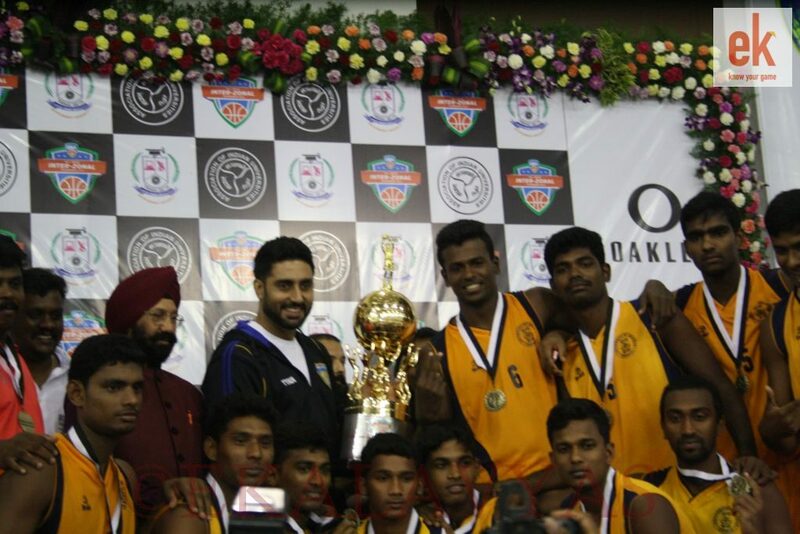 Vishnu Ravi Shankar & Gopalakrishnan R, Chennai, 19th January 2015: The battle of the city rivals in the final of the UBA All India Inter University Basketball Championship 2014-15 ended in University of Madras getting the better of host team, Sathyabama University. In what was a rematch of the South Zone final, the University of Madras were in top form and were able to exact revenge. The game began with Sathyabama off to scorching start with Arun Prashanth driving and dishing and connecting from the 3-point line as well. Sathyabama were up 13-2 five minutes into the game. After some stern words from their coach, University of Madras stepped up their game and clamped down on the defensive end. Their 6’8” centre, Jeevanatham was again the difference maker, as he shut down the paint and protected the rim. Along with forward, N Nagaraj, University of Madras dominated in the paint against the Sathyabama defence. Their point guard, Anto Bethle was the head of the offensive snake, as he controlled the tempo of the game beautifully. Sathyabama’s front line had difficulty working in the paint against Jeevanatham and they managed to score only 16 points in the paint as compared to 48 paint points from University of Madras. Jeevanatham had 5 blocks in the game and altered numerous shots as well. Sathyabama player (in black) lays the ball against Madras University. Sathyabama’s main shooter Vimal Raj had an off-night with poor field goal percentage in this game. Further, the absence of key forward Muin Bek to an injury sustained in the semi-final, severely hurt Sathyabama. 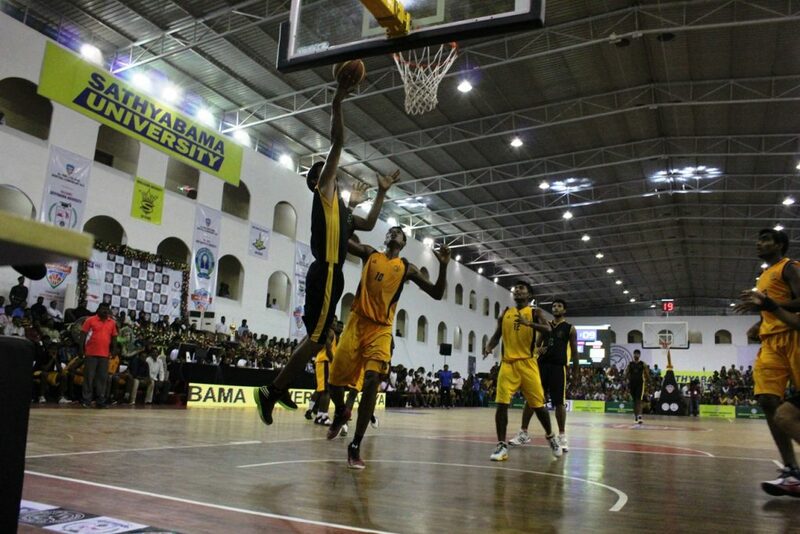 University of Madras ran away with the game in the second half as four players ended up with double-doubles. Jeevanatham dominated for 26 points and 10 rebounds, while N Nagaraj put up 20 points and 14 rebounds. They were ably supported by teammates Anto Bethle (19 points and 11 rebounds) and Karthickeyan S. (12 points and 12 rebounds). 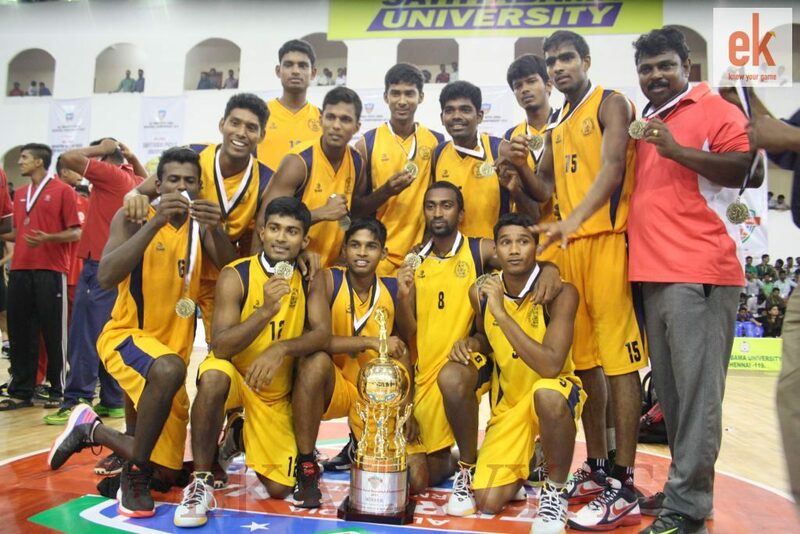 University of Madras ended up registering a 81-64 victory to be crowned champions of the All India Inter University Championship 2014-15. Abhishek Bachchan with the University of Madras team. Earlier in the day, Jain University, Bengaluru defeating Bharati Vidyapeeth University, Pune 123-115 to secure third place.